Earlier this Spring, the Philadelphia-based education think tank Research for Action held a Twitter chat around the hashtag #4percentchat, which was the number of non-white teachers that we have here in Pennsylvania. Yes, though 18% of the Commonwealth is non-white, teachers of color are much less rare. While this is a problem in Pennsylvania, its hardly one that’s limited to the Keystone State. When I posted this on my social media, one of my friends commented, “so what?” Sure, there’s an argument that the most qualified teacher should be at the helm of every classroom, and qualifications don’t have a gender, race, or identity other than being a quality teacher. But that knee-jerk reaction neglects a bit of history. As a history teacher, I can’t but help remiss the lessons that we’re all overlooking. It’s so poignant, Edward Graham of NEA Today reports, the lack of teacher diversity is “jeopardizing student achievement.” “Two decades ago,” Graham writes, “26% of staff was of color. Today that number is 18%. That means we’re losing ground.” Similar ground is being lost in students of color’s successes. Now 64 years after the landmark U.S. Supreme Court’s most landmark decision on Brown v. Board, schools are more segregated than ever. Yes, schools are more segregated now than we were in the Jim Crow era. Nowhere is that more apparent, says TheAtlantic, than in our nation’s teaching staff. That leads to some questions about quotas and hiring practices that have no easy answers (and the article spells many of those out, making it an essential companion read to this one), but America’s diversity at the front of the classroom is a still-lingering problem. To rephrase my friend’s question: “does it matter?” In short: “Yes.” The New York Times reports that boys and especially boys of color perform better when their teacher shares their gender or ethnicity. Additionally, the Philadelphia Tribute reports that having at least one member of the teaching staff being diverse helps non-white students in so many areas that count, such as graduation rates, standardized testing results, and personal connection. It might sound strange that this article is written by a 36-year-old white dude who taught in a place where the first black family to ever enroll in the school didn’t begin until 1999. I’m also the same white, male teacher who teaches in an affluent suburban district whose staff is 98% white. All that said, this discussion has to start from somewhere. Additionally, the Brookings Institute noted how white students benefit from having a teacher of color, as they expose them to new ways of societal thinking. It certainly helps the Confederate flags to be pulled from the front porches when we realize that leaders of color are influential. Growing up in rural, white Pennsylvania, I didn’t have my first non-white boss until my junior year of college. That certainly provided my cultural lesson pretty quickly. But it’s a lesson not everyone gets to enjoy. PBS-affiliate WHYY reports that more than 50% of Pennsylvania’s schools don’t have an educator of color, and 72% of our Commonwealth’s teachers of color teach in either Allegheny or Philadelphia County, our two major urban areas. When interviewed, a black female teacher who asked to be nameless said it’s hard to be the first and only teacher of color at a school because, well, they don’t feel welcome. The Confederate flags don’t come down as quickly as we’d think – and hope. That thought is corroborated by Former Pennsylvania Commonwealth Court Judge Doris A. Smith-Ribner, who wrote the article “Students of Color Are Increasing and Teachers of Color Are Not. Here’s Why and What We Can Do About It” for Education Post. She notes that though a majority of the country’s students are of color, only 17% of educators are. And one thing we can do about it is to support diverse teacher candidates to enter the field and round out our population, especially in encouraging black men, who only represent 2% of America’s teacher population. In Pennsylvania, the 6th most-populated stated and one where teacher certification is a valued college program, Pennsylvania graduated only 8 black men into teaching programs in 2016. EIGHT. The concern is so real that EdWeek identified Pennsylvania as one of 11 states that should seek to diversify its teaching staff by 2040. Some, like Washington State Teacher of the Year Nate Bowling, are taking the challenge by the reins. He’s led a national charge that statewide organizations like The Fellowship: Black Male Educators for Justice, led by Pennsylvania leaders like Dr. Vincent Cobb, II and charter school Principal Sharif El-Mekki, seeks to double the amount of Pennsylvania’s black male educators by 2025. Data on comparing Pennsylvania to other states isn’t as readily available as one might think. While national data is easily located (and certainly shines the light a lighthouse in the dark), the breakdown of state-by-state analysis proves tricky. The Center for American Progress notes that nearly 1/2 of the states don’t readily publish this information. Those that do tell an ominous tale of diversity’s disparity in so many states, and Pennsylvania is hardly the worst of them. California, the progressive beacon of America, for example, has a 44% gap between teachers and students of color. James Patterson of Teaching Tolerance does a great job of assembling this information into a plan to move forward. In his article, he notes of the analogy that many use for helping students of color become teachers of color as “the leaky pipeline.” Plugging the leak begins with supporting college students of color and encouraging “paraeducators [who] tend to be more diverse than teachers” to pursue the profession. The latter was true of a paraeducator named Ms. Garcia, who went from classroom support to classroom teacher to 1989 Utah Teacher of the Year and now President of the National Education Association. Yes, I’m talking about that Lily Eskelson Garcia, the leader of the nation’s largest union. She started off her career in education as a para, and now she’s its most powerful advocate. The NEA also highlights what the University of Maryland Baltimore County (UMBC) has enacted a 12-point plan to place students of color in teaching positions, which includes building a community around the students, providing a summer bridge program, and – gasp! – providing some financial incentives. This has unsurprisingly helped stave off the biggest “leak” in the “pipeline”: teachers of color leaving the classroom and moving into another profession. Which leads me to student-teaching, which is largely in need of reform. While many of America’s top students are taking paid internships to work for a company they’re often guaranteed to be hired to work upon graduation, student-teachers often work at negative cost (still paying tuition while working for free) for half a school year or more. This is a very difficult sacrifice for many working-class families, especially those of color, to bet on. It certainly looks a lot riskier than the alternative. Some teacher certification programs here in my home state of Pennsylvania are currently discussing increasing the timetable of student-teaching to a full year, which, though I’m not a betting man, would probably worsen the 8 male teaching candidate graduates of color and our #4percentchat. 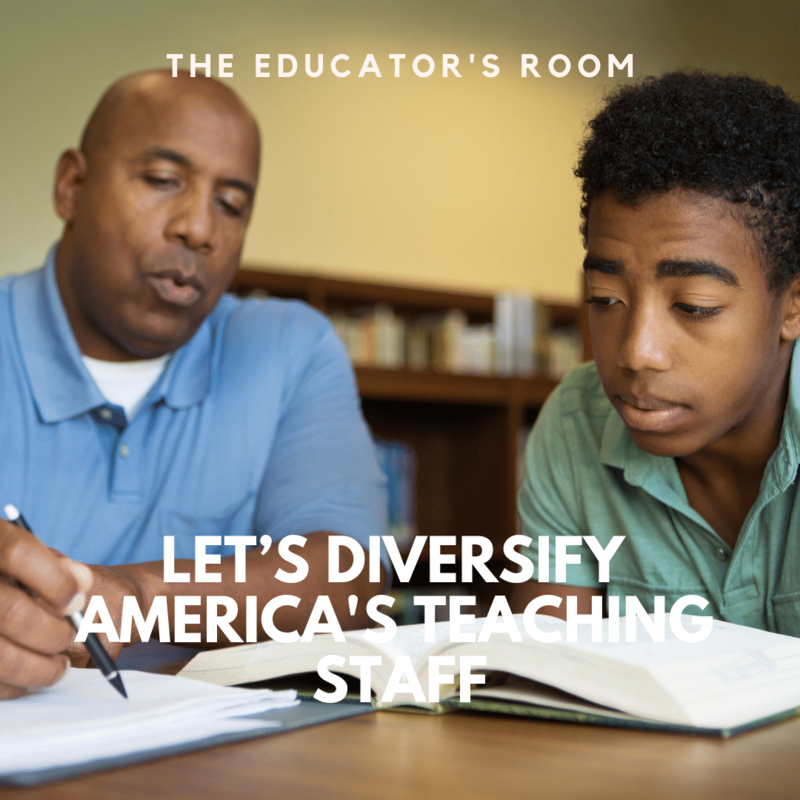 Most of all, to solve the problem of diversifying America’s teaching staff, we need all of our education stakeholders – policy makers, legislators, administrators, students, and others – to begin a nationwide discourse on the growing disparity. Otherwise Pennsylvania – and other states – will be having Twitter chats with a much lower percentage attached to the end of them.